I’d been tracking the progress of Jeelie Piece via their slow reveal on social media. It’s always a smart play to take this approach to building an audience prior to launch. I was looking forward to visiting to see how their ideas were put into practice. I was joined by Danielle from Edinburgh Foody. She’s been a regular guest over the years, but it had been a wee while since we’d last properly caught up over lunch. On the premises previously occupied by The Purple Pig (where Danielle had joined for the review, also), the interior is simple and smart with elegant cornicing. 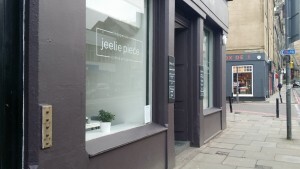 Part of Jeelie Piece’s offering is as a space for local emerging artists, with their scope extending beyond the visual arts to include music and jewellery over the coming weeks and months. There’s already a burgeoning sense of community and they’re seeking to build upon that, with events such as election hustings planned. 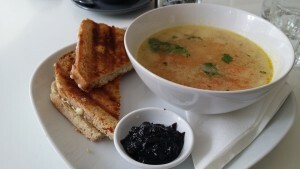 Their menu brings together a range of local suppliers, including lots of stuff made in-house and bread from Breadshare. The cheese toastie caught both our eyes. I added a bowl of chicken and vegetable soup for good measure. Coffee is from Obadiah. It was delivered to a very pleasing standard. Our food quickly arrived looking neat and tidy. The soup, made by one of the owners, was very good with a light and flavourful broth amply stocked with veg and chicken chunks. My accompanying toastie was really good, too, with particularly satisfying bread, good pickle and a well-judged blend of cheeses. Grilled cheese sandwiches seem to be having quite the resurgence at the moment; this was a pleasing addition to the city’s range. 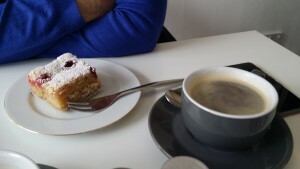 Danielle rounded things out with a portion of raspberry and frangipane cake that looked really good. The other co-owner had made it herself and delivered it to us, rounding out her excellent contribution in genially hosting our visit. So overall, I really enjoyed Jeelie Piece. It seems to be offering something just a little different so is a very welcome addition. I’d recommend it to you and will no doubt be back for further visits.